today, i’m participating in a fun monthly blogger event — the secret recipe club. how does it work? every participating blogger is secretly assigned another blog + chooses a recipe from that blog to make. on reveal day (today! ), all of our posts go up at the same time, + everyone gets to see who was assigned to their blog, which recipe they chose, + how it turned out. fun, huh? this month, i was assigned melanie’s blog, fabulously fun food, which is full of tons of amazing recipes, both sweet + savory. 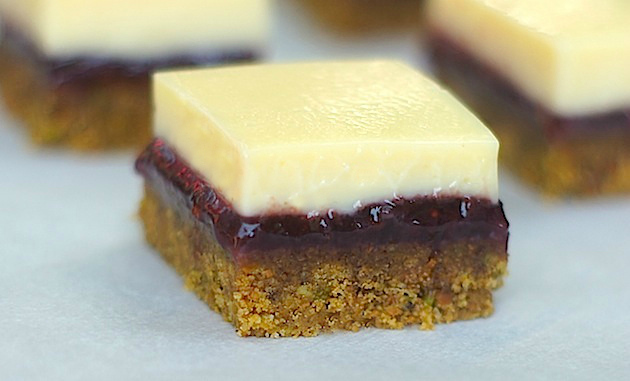 we had a Memorial Day party to attend, + i knew i wanted to make a dessert, so i decided on her amazing-sounding lime squares with pistachio-graham cracker crust. for a little twist, i added a raspberry layer – i thought that the sweetness of the raspberry would work perfectly with the tartness of the lime. thankfully, the flavors worked great together! 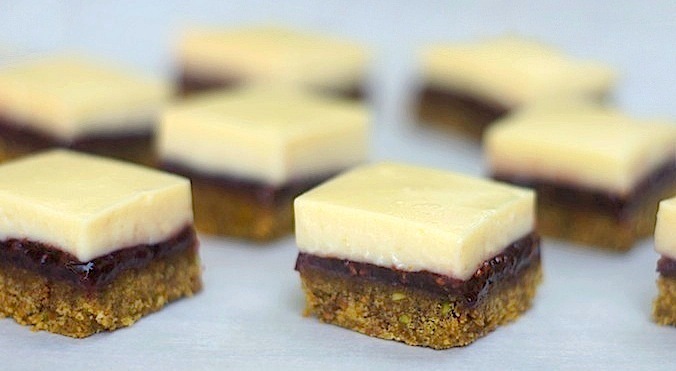 these squares turned out wonderful – the tartness of the lime, the sweetness of the raspberry + the buttery, nutty flavor of the pistachio-graham crust all work beautifully together. the citrus adds a bright, fresh note that makes them taste light + fresh, even though they’re rich. between the bright citrus + sweet raspberry, these really are the perfect warm weather treat – they’re just begging to be served at a springtime dinner party of summer afternoon cookout. thank you to melanie for introducing me to a fabulous new dessert, + to the secret recipe club for connecting me, yet again, with fantastic bloggers + amazing recipes! preheat oven to 350 degrees. brush an 8-inch square baking dish with melted butter. line bottom with parchment paper, leaving a 2-inch overhang on two sides. in a food processor, finely grind pistachios with graham-cracker crumbs, sugar, + lime zest. blend in butter. press mixture into bottom + 1-inch up sides of prepared pan. bake until lightly browned, 8 to 12 minutes. cool crust for 30 minutes. to make the filling: in a large bowl, whisk together egg yolks + condensed milk. add lime juice; whisk until smooth. spread raspberry preserves/jam evenly into cooled crust. put in freezer for about 10 minutes, just long enough to set. after raspberry layer has set for about 10 minutes, pour lime filling on top; carefully spread to edges. bake until set, about 15 minutes. cool in pan on rack; then chill at least 1 hour before serving. using parchment paper overhang, lift out of pan, + transfer to a cutting board. With a serrated knife, cut into 16 squares, wiping knife with a damp kitchen towel between each cut. *note: lining the pan: cut parchment 8 inches wide + at least 12 inches long. place parchment in buttered pan (butter will hold paper in place) so it hangs over the sides. this will help you lift the bars out easily. Those look so pretty and delicious! I can only imagine how all the different flavours compliment each other! My fear is that I’d eat all of the pistachio graham cracker crust before ever forming the bars. Simply amazing flavor combo you & Melanie concocted and so perfect for summer! But you have to tell me your secret to cutting these so perfectly. Your food styling skills are terrific Amy! you’re too sweet, ally! honestly, i’m not sure how these cut so perfectly – i think it was just luck! These look wonderful. I absolutely love the addition of pistachios in the crust!